I’ve been married for almost nine years. Before marriage, I lived with two other roommates. Before that, I cooked for my sister and parents. Essentially, my experience on cooking for just one person is pretty limited. I’ve almost always cooked for at least one other person and haven’t had to consider the difficulties that come with cooking for just one. But for many of you, this is a big deal. Several of you have asked me for tips on cooking real food for one person, and I really wasn’t sure where to begin since my experience in this department is fairly limited. Bridging the gaps between reading the how-to on a blog, and making it work for your own situation. So despite my inexperience in cooking for one, we’re talking about it anyway because it impacts YOU. After lots of reading and even more thinking, I’m sharing 13 tips for cooking real food for one person. I hope that it helps those who struggle in this area, and sparks new ideas for everyone else! #1 – Decide what type of home chef you are. This is the most important tip because essentially, this determines how everything else applies. Also, because figuring out your cooking style will help make more sense of what cooking for one actually looks like in YOUR house. There are two extremes to consider here: The person who likes spending time in the kitchen and enjoys making each meal from scratch every night, versus the person who would rather spend as little time in the kitchen as possible. If you truly find pleasure in the process of cooking, feel free to make dinner for yourself every night! Cut recipes in half (more tips on that below), cook the full meal and have leftovers for dinner the next day, or freeze them for a different night. If you don’t want to make dinner every night, cook once and eat twice whenever you can (more on that HERE). This could be cooking one big meal at the start of the week and eat leftovers for the rest of the week. Meals like creamy squash pasta bake, northern beans and ham soup and chicken and spinach enchiladas would be great for this. Or, this could be making a portion of each meal and adding other items as needed. An example of this would be browning a big batch of ground beef for shepherd’s pie, adding some to lentil macaroni and then tacos later in the week. 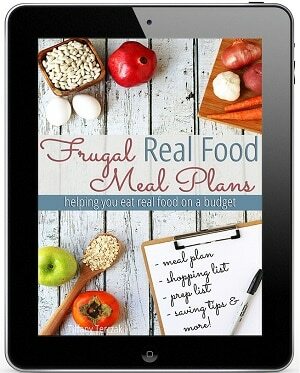 #2 – Create a meal plan. Probably the most overlooked concept when you’re cooking for one, but you should always have a meal plan in place. You already know that meal plans save both sanity and money, but a bigger aspect to consider when you’re cooking for one is food waste. Having plan means buying only what you need, and ensuring you’re using it all up. It doesn’t have to be complicated – figure out your cooking style, write down a few ideas of what you can make with what you have, and match it up to your personal schedule. Add in a new recipe you’d like to try and consider it done. 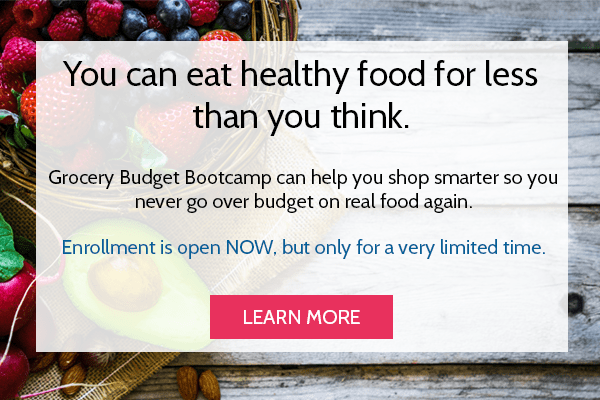 Shameless Plug: If you struggle in this area, check out a super simple meal planning method or consider signing up for our meal plan membership services. #3 – Master the art of making less. One of the biggest hurdles of cooking real food for one person is cooking too much food. Learn to cut recipes in half, or even into quarters if necessary. Use online tools like this conversion calculator to help with the ingredients, and consider investing in a kitchen scale so coming up with 1/4 pound of pasta isn’t that difficult. Also, learn what types of meals are good for the freezer, and which ones aren’t. This way you’re better prepared to decide whether to halve or quarter a recipe in order to reduce waste. #4 – Don’t rule out feasts. It can be difficult to balance the desire to cook a full course meal verses the one table setting, but you don’t always have to choose one or the other. Invite friends and family over and let your inner hospitality shine! Don’t limit feasts to just the holiday season. Purposefully schedule nights where you can go all out and make appetizers AND dessert. Pulling out all the stops like this allows the creative inner chef to shine, and you won’t feel restricted by the number of plates on the table. 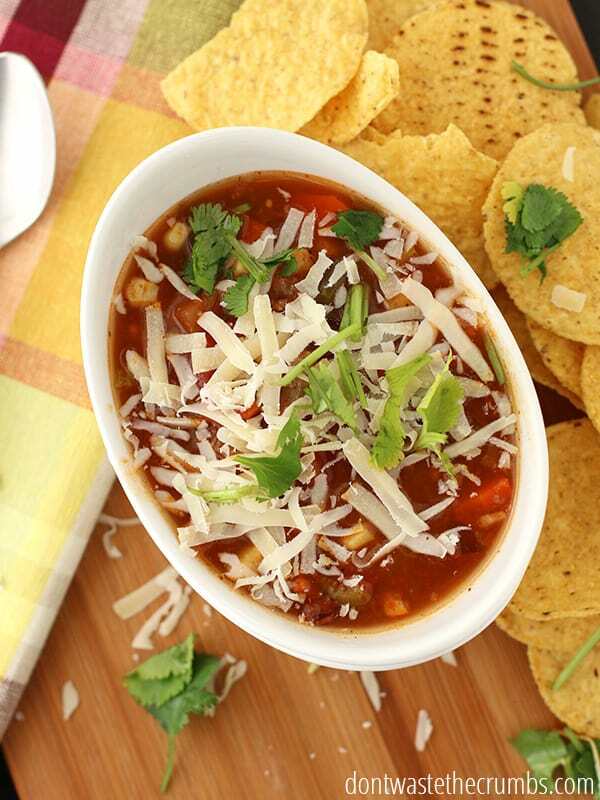 #5 – Always keep a container of soup and fresh bread in the freezer. Inevitably, there will be times when you need something fast for whatever reason… you’re sick, it’s a busy night, you just got home from a business trip and too exhausted to cook… Having something on hand that can be warmed up in just a few minutes will make it easier to stay away from fast food, and ease the load when it’s just you taking care of you. #6 – Consider a cooking club. 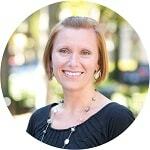 Simply Rebekah has a great write-up of how a few families did this at her church, but you can do it with singles too. Personally, I think this is a great way to get out of a cooking rut and try new recipes you wouldn’t ordinarily try. #7 – Consider a canning club. Along the same lines, but specifically geared for those who like to can and enjoy the rewards of the garden. Team up with a few friends (or families) over the spring and summer and swap homemade canned goods. You show up with jars of zucchini salsa for everyone and you bring home strawberry jam and pickles. You enjoy the bounty of the season all year, and don’t have to figure out how to eat a dozen jars of homemade apple butter! #8 – Consider a gardening club. Once again, team up with like-minded people and share your gardening strengths. If you can grow tomatoes like crazy but stink at zucchini (me), then swap goods with a friend who has an abundance of zucchini and zero tomatoes. #9 – Share shopping in bulk with a friend. Those massive bags of rice at Costco are most definitely a huge money-saver, but practically speaking, it would take one person quite a long time to go through 25 pounds all by themselves! Coordinate shopping with a friend to take advantage of bulk pricing while not having to keep so much food on hand (both in terms of keeping food fresh and finding a place to store it all!). #10 – Learn what to do with aging food. A gallon of milk is cheaper than a half gallon, but what happens if you don’t go through a whole gallon fast enough? Try making your own buttermilk, ricotta cheese, yogurt and kefir instead of throwing it away. 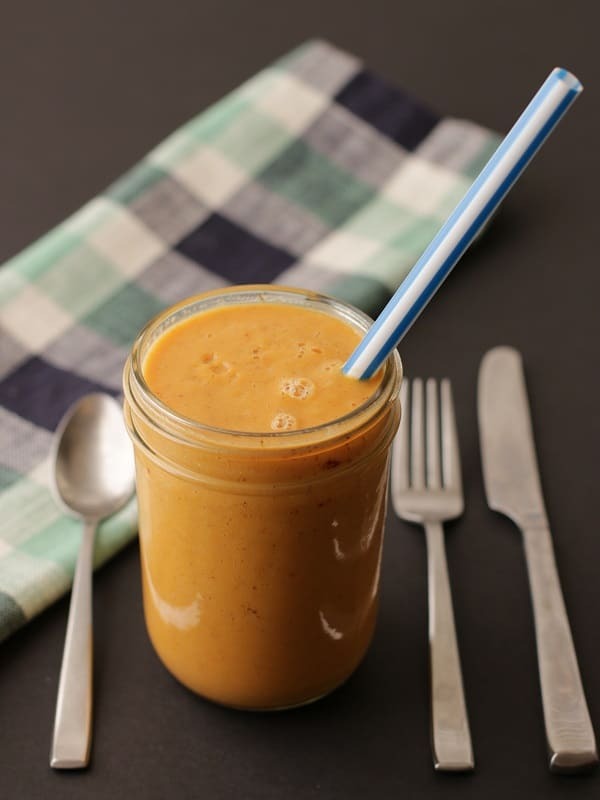 You can then use those items in recipes, like buttermilk pancakes and banana bread, homemade salad dressings or smoothies (which can be frozen, by the way). Tip: Thanks to the fermentation, yogurt and kefir last a REALLY long time in the fridge. We’ve gone up to four weeks before, without any issues! Eat fragile vegetables like spinach and green beans first, and save the sturdier vegetables like squash and potatoes for later. 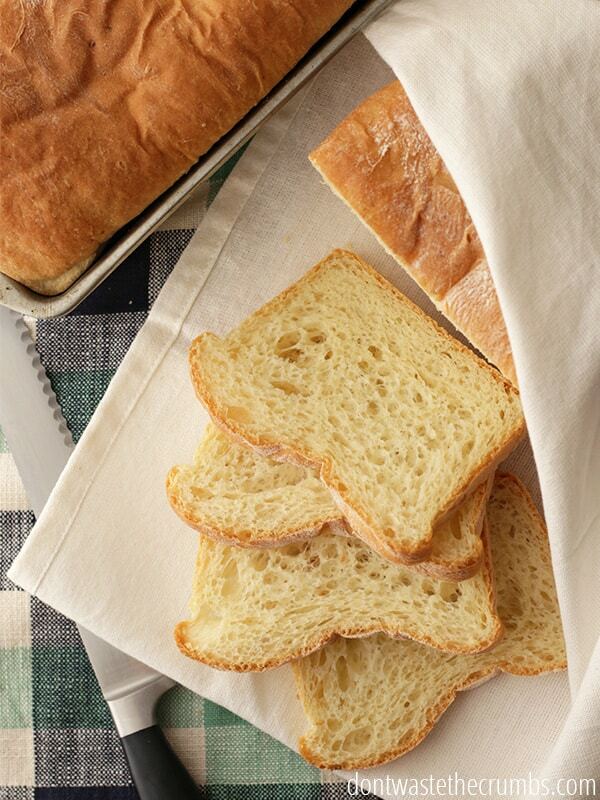 Enjoy freshly baked bread on day one and two, sandwiches on day three and four, and then make croutons, breadcrumbs or Panzanella when the crust becomes too hard to chew. #11 – Keep meals simple. Even if you like cooking, making three meals every day can get tiresome. Lighten your load by keeping breakfast and lunch simple, then pulling out the big pots and pans for dinner. 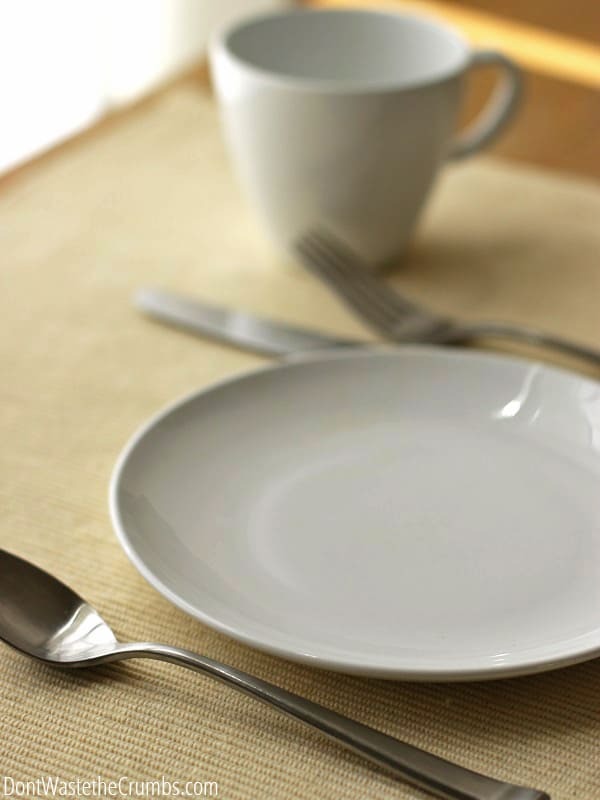 Richly Rooted has a great list of simple meals for singles, and as a perk, there’s less dishes to wash! #12 – Make cookies for the freezer. Big pies and cakes are the demise for someone with a sweet tooth who lives alone, so make a half batch of cookies instead, but freeze the dough before you bake it. Then you can pull out one or two balls of cookie dough and bake them fresh. And you won’t have dozens of cookies staring you in the face when you’re done. 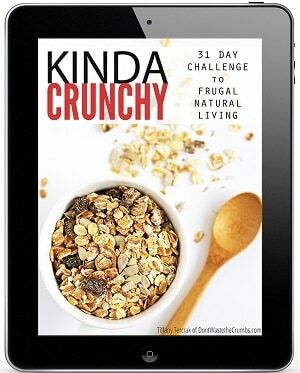 #13 – Don’t ignore all the budgeting tips! Just because you’re not feeding a crowd doesn’t mean you can ignore all the tips you stumble across. Learn to preserve and reduce waste. Buy in bulk and freeze. Shop for good deals. Be smart with your time and energy in the kitchen. 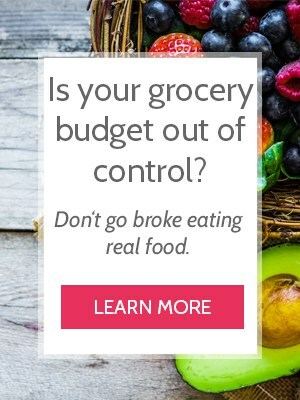 And most importantly, create a grocery budget! Are you single? 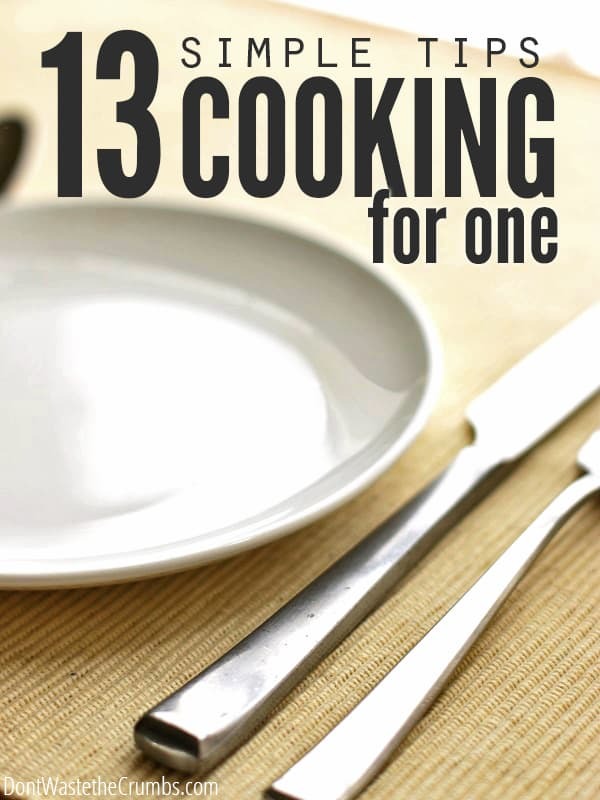 Or do you cook for just one person? I’d love to hear how you make real food for one work in your house! I wish I would have found an article like this years ago. I was single for a loooooong time and felt rather out of my element in the kitchen. After a long or challenging work day it was easy to cave in to take-out or less than healthful choices. No one else was depending on me to make a meal. And don’t get me started on the “just invite someone over to share your dinner” advice. In retrospect, I think a huge challenge for single people to realize that even though you’re preparing a meal for just yourself, you are worth the time and effort and deserve a good meal. Having a plan would have helped tremendously as would having meal components in the freezer ready to go. You’re absolutely right – YOU are worth the effort of it all… planning, prepping, cooking… just because it’s just you, doesn’t make it any less important! I think it’s also really helpful to scout out smaller-scale pans, casserole dishes and the like, to enable you to make 1 or 2 servings at a time. I have some small, square Pyrex baking dishes with lids that I LOVE, and a casserole in them makes 2 neat servings. That way you can make a larger recipe and portion it into several smaller dishes to bake one at a time when needed, or else just make a small quantity to start. And psychologically, it’s much more enjoyable to cook for one if you can do it on the right scale, rather than constantly battling equipment designed to cook for 6 or 8. I agree with the idea of having ‘feasts’ even by yourself. It can definitely be hard to feel like it’s worth it to cook anything elaborate for just yourself, but when I lived alone I did find that it helped to create special occasions for myself: plan a movie to watch, set the table properly, cook something really tasty, have a nice drink, etc. Having a good movie or a book to look forward to made it feel more an occasion and helped with the ‘eating alone’ factor. Wow – that’s a GREAT tip Jennifer! I never thought about smaller pans! I think the cooking for one is as much a psychological hurdle as it is practical, since I think we’re wired to cook for more (and seeing recipes for 4-8 servings everywhere doesn’t help). Creating a feast for yourself sounds like fun! A nice table setting with a movie coming up… with a big bowl of popcorn? Oh man, sounds wonderful! I DO struggle with cooking dinner. My pantry is non-existant and I don’t have meal plans; definitely something to work on. Is there a pantry supply guide? THANK YOU for this post! I emailed you a few months ago with some challenges of a single person, and I never heard back. I figured you did not have much experience with this topic and just kind of went in a different direction. Joke is on me! Thanks again. I really agree with your point # 1: decide what kind of kitchen commitment you are up for. Me, I’m a cook-every-day type of person. I get bored eating the same thing all week (therefore not eat all the leftovers and discarding a lot of food) and I don’t care for frozen/thawed/warmed food (exceptions: chili, homemade pasta sauces, lasagna). Most bulk cooking is lost on me. That said, majority of my suppers take 30-45 minutes from chopping to sitting down to eat, and it doesn’t feel like a chore. Recently I’ve been thinking of food differently, and making more modular meals. There are always beans, grains, and chopped/shredded cabbage/kale/carrots hanging out in my fridge. Variously assembled, these can become saucy curries, whole grain bowls, soups, or salads – without me feeling like I’m stuck in the same supper all week. My other big go-to breaks all the rules: Breakfast for Supper. Because eggs and hash browns, yo. And I incorporate any leftover hash browns as described above: they go on a salad, or into soup. I cook for the two of us. And what seems to work is cooking up a bunch of things on the weekend. Sometimes I roast veggies or make a casserole type dish like that Autumn Squash bake or enchiladas. I usually roast chicken every week and I make stock from the bones. This winter, I bought some dehydrated veggies and they make soup super simple! I add some fresh veggies, maybe pasta or beans and I can have soup in a half hour. The stock freezes well too. And we love biscotti, which satisfies my boyfriend’s sweet tooth, without being full of sugar. I make a double batch on the weekend, one with chocolate chips and one with dried fruit. It’s important to me to be able to pull together dinner without a lot of thought. I am still learning about menu plans, but that once a week cookout really helps. I use the cook on the weekend and reheat all week too. I find that I wont cook after work but I will reheat. Knowing that I spent time (and money) making something keeps me out of the drive through. My work schedule is unique from most in that I have to eat dinner quickly before leaving for work and on weekends I have to be able to pack my lunch and dinner in a lunch box to bring to work. I’m in the category of cook once and eat all week. It started when I was working 2 jobs and doing online classes, I only had a 4 hr window of time each week for meal prep so I would pick 1-2 recipes and make enough to cover all the meals of the week. then divide everything into individual pyrex containers in the fridge so they could go in my lunch box for work (where I only have a microwave option) but still in glass container so I have options for re-heating at home. It seems to work for me but some people may not like eating the same thing for 12-14 meals in one week. I have recently started make more soups from scratch and freezing them in 1-2 serving containers which is nice when I want something different on short notice. Great ideas Jenn! Freezing soup to use as an alternate meal is brilliant! Thanks for the article – my DD will hopefully be attending uni in September and is a stranger to the kitchen so I have sent her this to mull over, she has a good grasp of what the good stuff is so here’s hoping another fledgling can try out her wings with such great advice. Am putting together a simple cookery book for her to take with her. I like to cook each day and echo the small pans post and recently acquired a small pressure cooker from India which is fantastic for small portions of lentil and beans so I can use dry instead of expensive tinned. Another thing I do is make attractive labels for freezer boxes – saucy sausage pasta, kicking chicken and health in a bowl sound more appealing and puts a bit of fun into defrosting. No excuse not to enjoy the process. Nice china plate, napkin and cutlery make all the difference to the occasion and because there is only one thrift stores are good places to find one off lovely plates and no need for place settings for 8! I’ve been cooking for one for most of my life and have owned a freezer for the last 40-odd years, and b o y… do I ever use it! For as long as I can remember, I have been cooking pasta and rice by the package (4-6 portions) and freezing them portion-wise in small containers which make thin, brick-like portions. Once frozen, I repack them in thin plastic bags and stand on edge in a container. No need for thick (expensive) freezer bags, cause I go through them in no time! Since buying a dehydrator, I now dehydrate my cooked pasta and rice, when only need to be microwaved in some water to prepare. As for the meat/veggie concoctions, I can n e v e r make just one portion anyway, so I make like 4 portions at a time, freeze them in the same li’ll containers, and repack (so I can use the containers again). Come dinnertime, I just grab 2 “bricks” from the freezer and microwave. I live in the Netherlands and we eat a lot of (singe serving) meatballs here. I’ll get 2 pounds of ground beef, prepare with herbs, egg and breadcrums. Form them into patties (easier to store in the freezer), make the gravy and freeze 8-10 of them complete with the gravy. I’ve done the same with pork chops, but they do come out a bit soggy after freezing. I’ll also cook 4-6 portions of dishes like Chili Con Carne, Fried Rice (Indonesian Nasi) or Goulash, so that I only have one (larger) “brick” to microwave. I’m sure this could also be done with many casserole dishes. Once you start thinking along these lines, the possibilities of having you own little “freezer-factory” are endless! These are great ideas! I remember cooking for one was an area where I really struggled when my husband enlisted in the military; I had been cooking for two for so long that I didn’t know what to do with myself! During boot camp, I ate a lot of processed stuff from Trader Joe’s, and it wasn’t until the first deployment (a few years later) that I actually got better at cooking for just me. I don’t mind eating leftovers for a meal or two, so there were some things I’d just make regular batches of: soup, pasta, daal, stir fry. Other things, I’d do part of the work (make a big batch of pasta sauce, some of which would immediately get frozen) at the beginning of the week, and then cook the last part every night (the pasta). I found a few favorite cookbooks that had a lot of recipes for just one or two (easy to split in half for just me), and that helped a lot too. Before I was married and only cooking for one I relied heavily on keeping meals simple. Especially in the produce department, frozen veggies were my key to good nutrition. Now I cook for two and find knowing what’s in my fridge and like you said knowing what to do with produce nearing the end of its life expectancy has really helped in the food waste department. Only buying what you need is crucial, pull off those extra bananas at the store if you are not going to eat them it will just be dollars in your trash can by weeks end. Your tip #3 Master the Art of Making less has allowed me to enjoying baking an array of cookies, donuts and breads in much smaller batches and keep my body in the shape I am accustomed to. Thanks for all of the great tips, I had never considered a gardening or canning club before. I became single in September 2014, when my husband died. Prior to that, I cooked for two for 41 years, so I thought that would help me cut it back to cooking for 1. That hasn’t happened. I still struggle with the issue that nothing sounds good most of the time. I still often bring home items from the grocery, eat one serving, and then let the rest sit in the frig until it needs to go in the trash. My budget is very limited, so this really bothers me, but I have not been able to curb this waste/behavior. I do use my crockpot, which always makes enough for at least 5 or 6 meals for one. I have freezer space, so it is simple to package and freeze single servings for later use. I am still struggling with grief issues, so have not had the presence of mind to focus on what I am buying, eating, wasting. That is on my list of things to do. 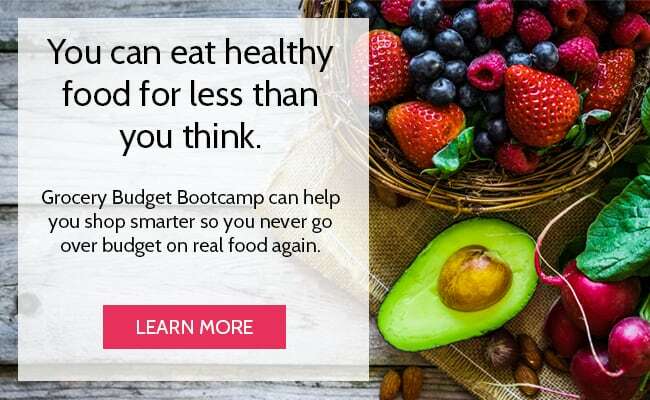 Thank you, again, Tiffany, for all your help with learning to eat real food and stay on a budget. I will likely continue to work on it for the duration. I too lost my husband of 41 years, in the Spring of 2013. The grieving process is the hardest thing I’ve ever gone through. And yeah, nothing seems appealing or appetizing for a long time. But some tips for what they’re worth: #1. Find new recipes, either on the Internet ( try Pinterest!) or buy a beautiful new cookbook. Leave the old favourites that you shared with your hubby alone for a while. 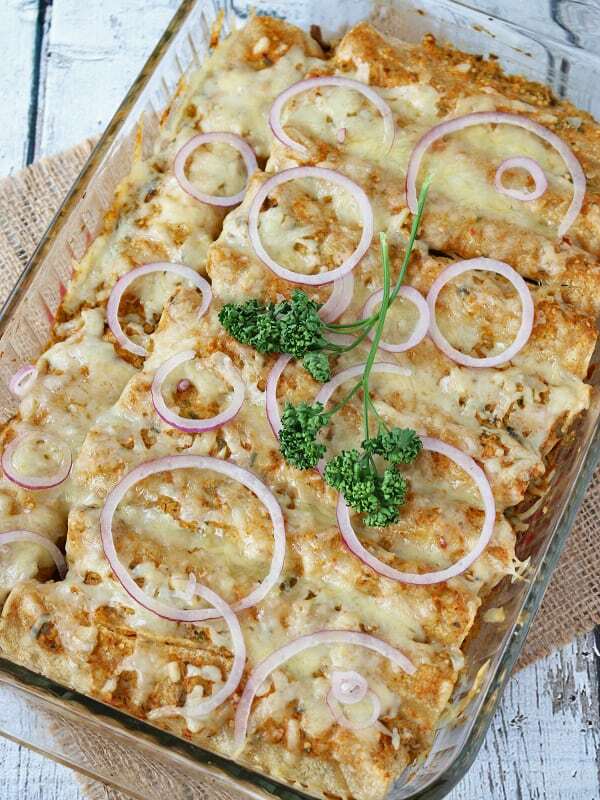 #2 Make dishes that are easy and fast! Leave the time consuming and complicated recipes for when your energy and focus returns. #3 Making a double portion means only cooking once for two meals! #4 Try to eat on time, perhaps in front of a silly TV sitcom at the same time each evening. #5 I set up a pretty tray, nice placemat, little salt/pepper, etc and often ate my meals in the TV room, not alone at the table across from the empty place! # Go ahead and buy yourself little “treats” ( like those expensive fresh berries!) once in a while. Stay well! The second year is the hardest. I found that cooking a medium sized pot of brown rice and keeping it in the fridge for the entire week helps. One must measure a cup at each meal otherwise it can cost in calories. For work I place a cup of the rice (3x more nutritious than white) in a glass pyrex bowl (one serving size and comes with plastic lid), add a piece of frozen salmon and sprinkle top with lots of frozen veggies. The salmon is wild pacific in a large frozen pack of long thin filets. I crack the filets on the counter edge and place 1/3 (about a 2 ” length) in the bowl on top of the rice. I take this to work and cook until done, depending on your microwave. You don’t need to refrigerate because the fish and veggies are frozen. When done, I top with a little Bragg’s Liquid Aminos which is raw, tastes a bit like soy only not as salty, ULTRA-healthy, and sprinkling this adds just the right amount of seasoning. You can also sprinkle with black or red pepper (red is healthier). Thank you! Enjoy! What a fantastically simple recipe Jane! Thank you for sharing!